This is the second part in a multi-part series that will cover everything you need to know about your vehicle’s fuel. 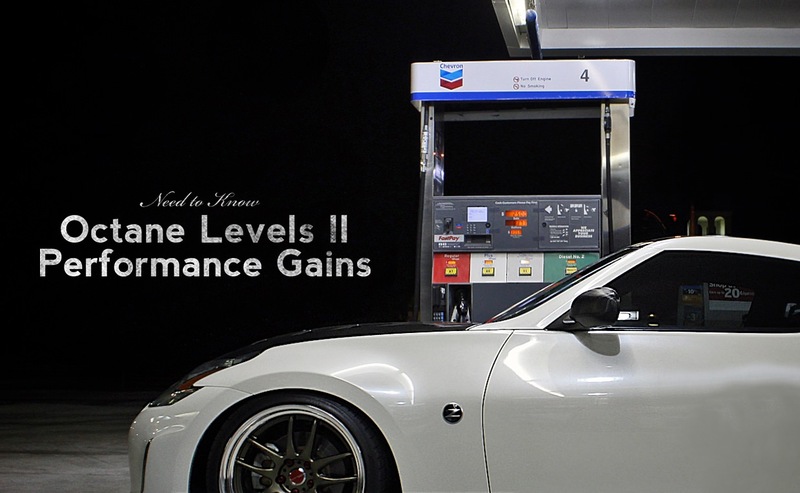 Today we are looking at higher octane fuels, what happens when you use them in a performance vehicle and why it is not helpful to use them in your regular car. - Part Two: Need to Know: Octane Part 2 (Performance Benefits)? In part one of this series we learned that octane levels in fuel indicate the amount that fuel can be compressed before it spontaneously ignites. Matching the octane rating to the compression ratio of your engine gives you an opportunity to get the most amount of power from your engine, but not in the way you might think. Gasoline has an energy density of about 42.4 MJ/kg. That is how much energy is in the fuel, not how much it delivers. 70-75% of that energy is lost as heat generated during engine combustion, leaving only 20-30% of that energy to actually move your car. The energy density of the fuel at the pump can be higher or lower by up to 4%, depending on the fuel blend used by the refinery, and regulations set by the country. In some countries, the blend changes with the season, yielding slightly better or poorer performance and fuel efficiency with a corresponding increase or reduction in pump prices. Since higher octane fuel does not contain any added energy density, what possible effect can it have on the performance of a vehicle? Well, it has to do with timing. In part one of this series we talked about how premature combustion can cause a knock in your engine and how that causes a loss of power. In a high performance high compression ratio engine of a sports car, the higher octane fuel matches the engine timing to ensure that you are getting all of the power you can out of your high performance engine. Does this improved timing increase your power, or does it do more than that? Such high compression ratios—and the premium fuels that go with them—could be turned to efficiency, rather than speed. William Green, a chemist at the Massachusetts Institute of Technology says that if high compression engines were put into the engines of lighter cars like his Honda Civic, their efficiency would increase and carbon footprint would decrease. Other automotive fuels, such as ethanol, can also offer high octane ratings, allowing oil companies to use more volatile gasoline in such blends. While the future holds two paths for high compression engines, one pointing to increased performance and the other to greener pastures, the conclusion remains the same: only use an octane level that matches the compression rating of your engine, and always follow your owners manual to save you money and increase efficiency.